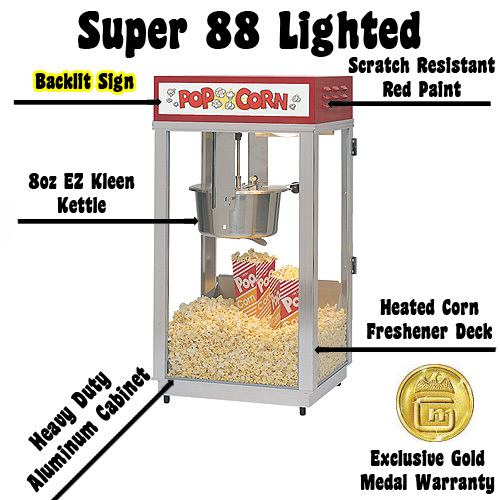 Gold Medals Super 88 Lighted Popcorn Machine 2489 features, Heavy Duty, all welded frame. 8 oz E-Z Kleen kettle, removable. Twin hanger arm kettle suspension. Heated Corn deck. Tempered glass. Heavy duty kettle drive motor. 120 Volt, 1700 Watts Its easy to see why the Super 88 Lighted popcorn machine will attract more customers a lot faster and increase popcorn sales dramatically. Order yours today!. 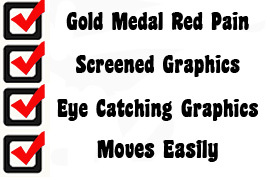 The Gold Medal Super 88-8 oz. 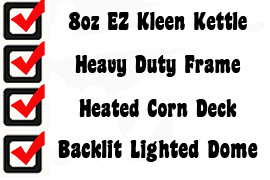 lighted popcorn popping machine offer the 8oz E-Z Clean Kettle that everyone loves. The all stainless steel kettle provides easy clean up and long term reliability. This is the least expensive 8 oz. Easy Clean Kettle on the market! Guess that's why it's a top seller! This machine includes a heated popcorn floor, old maid's tray and cabinet light. BONUS--This machine has a backlit dome light for added popcorn sales.